I should also mention that my Kerry Wood list is also up there. I didn’t put him in the title, because the title was too long to begin with, and AdamE didn’t send me any KW’s in his extremely generous trade package. Yes, that’s right, I tricked you into clicking on another trade post! Bwa-ha-ha and such. Like my last post from a couple days ago, this too has been sitting scanned since February. However, I purposefully didn’t post this. My goal (now being accomplished) was to debut my want lists along with the goods. It just took me a long time to format the lists from Beckett’s website to fit my needs for both players since there were so many cards. So, yeah, my want list spreadsheets are live for all three of my new player collections! And thanks to the great AdamE from Thoughts and Sox, I have a nice head start (especially in the Frank Thomas side of things). First, let’s start with Tony. How has this product lasted this long? 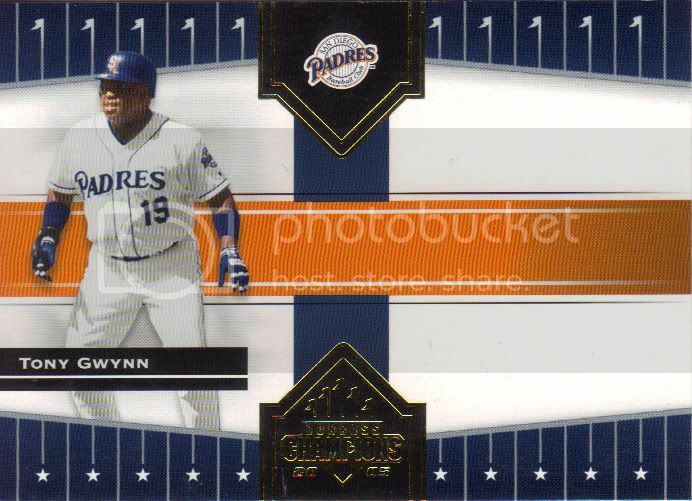 The Gwynn side of things was only a few cards deep, so I’ll just show off a couple. 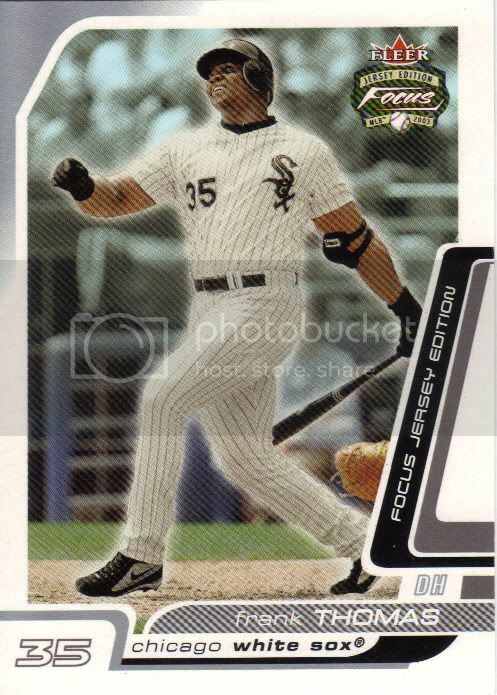 First up is a Rookies & Stars card that is already a decade old, if you can believe that. Guess which category Tony fits into. The picture makes it look like he got a hold of one, which would be pretty astonishing. 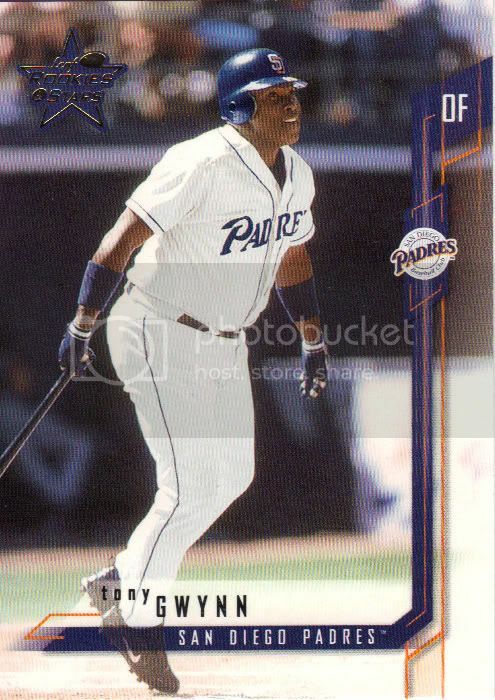 Gwynn only hit one homer in the 36 games he played the season before. According to baseball-reference, it was a home game against Al Leiter of the Mets to tie the game up at 3 all in the bottom of the 6th, so there’s a chance this picture is from that game. I feel like the card is a teeter totter about to tilt to the left. Someone explain the appeal of this set. 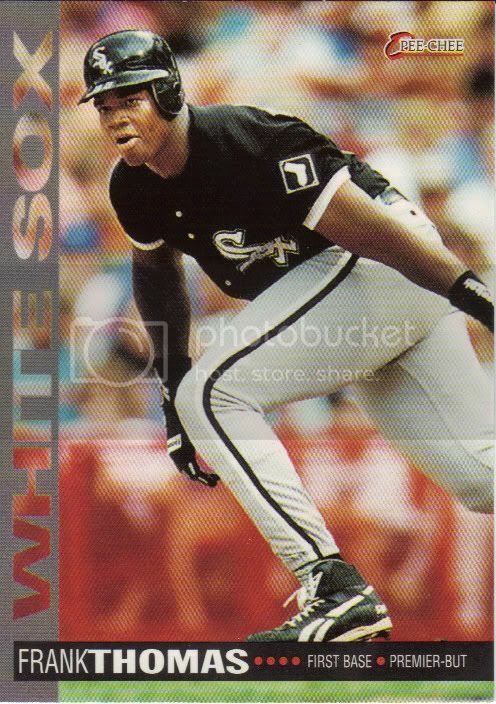 This is Donruss at its “finest.” There’s the makings of a perfectly fine card, which is then ruined by the wide open, un-utilized space on the right half. Of course, that is reserved for a jersey or potential autograph, but those are extremely rare. More likely, you’ll come across the colored parallels which will suffer from the same space issues. I also don’t understand why Tony has four different cards in the set. This is card 439. Cards 42, 46, and 47 all have different pictures, but all come equipped with full parallel sets to chase. This set will prove difficult to keep track of when I’m out and about. The back of this card talks about his book, “The Art of Hitting.” If ever there was an authority on the subject. I wonder if the other three cards will give a different description to make them actually worthwhile. Now let’s get into the power portion of our portly program. Please. I am not familiar with this O-Pee-Chee release at all. I just always sort of assumed that Premier ended in 1992. This looks an awful lot like Triple Play from the following year. I wish I had an example to show, but I bet you all have seen them anyway. It’s interesting how the reigning MVP has to bend down to fit into the frame. They don’t call him “Big” Hurt for nothin’. It’s also a nice change of pace to see a non-home run swing photo. I’m finding that almost all the action shots could very well be long ball related. 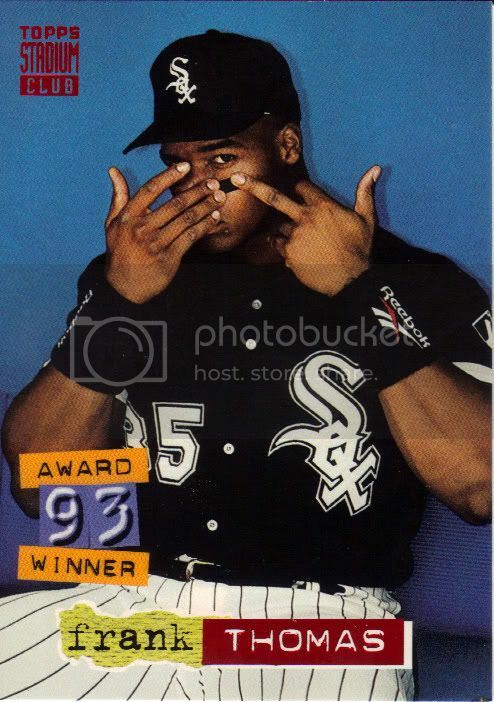 Less infamous/controversial than the 1991 Upper Deck card, here we see Frank flipping us off once again under the guise of applying eye black. Maybe what he’s really giving the bird to is the extreme crazy 1994 Stadium Club design. It’s totally schizophradical, dude! Expect to eventually see plenty more of this set since this was the beginning of parallel madness. We’re talking first day issues, golden rainbows and members only. Plus, there are 3 subset cards that feature all of those. Looks like I’ll be fighting Andy for turf a couple times. I love Fleer Ultra. I think basically everyone does. What I don’t love is how gollygee similar each year’s set is to every other year. Still, I can’t help but get excited at the simple glance at an Ultra card. Even if I can’t figure out the year from the front, it still seems special to me. Funny how that works. You brand yourself as a premium product back in the days when that meant paying more than $1/pack, and the concept sticks all this time, despite the fact that packs of 2007 Ultra can be found in the “discount” bin for $1.59. Sometimes I think the hobby needs to regress. This was one of the major draws of the package in my mind. You know me. I like shiny things that shine. This is colored shiny bits that shine pretty colors in my face hole. This be good to eyes. While I’ve never heard of this set (Black Diamond Rookie Edition, for those keeping track), I like it a lot based on this small sample size. It’s different and unusual enough, and eye catching enough to make anyone take notice, and that has to be a good thing. I can’t tell if this is a canted angle or a very sharp turn or both. Authentix has always intrigued me as a product. The card has perforation marks and the little bar code at the bottom to, of course, make it look like a ticket. I wonder what that bar code says. Anybody happen to have a scanner to see if there’s some cool hidden message in there? 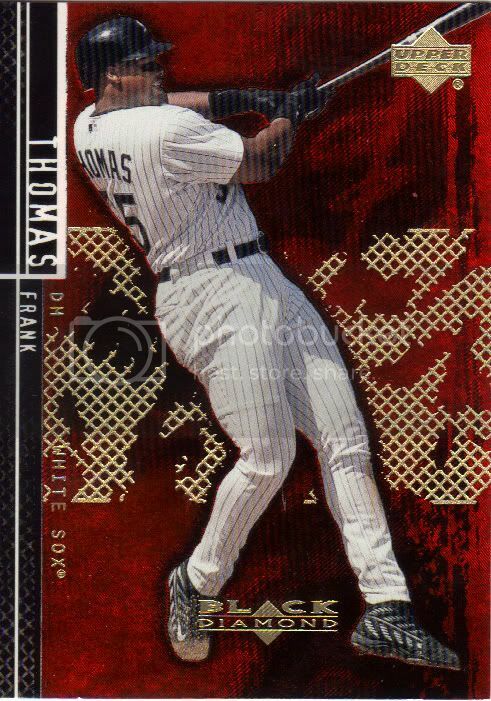 The only other thing I can say about this card is that Thomas rounds the bases so often, he’s achieved lift off! Look at how high above the stadium he is. Maybe he’ll stop by and say hello in this terrible seats. Float on down to home plate now. Oooo, the Indiana Jones card. 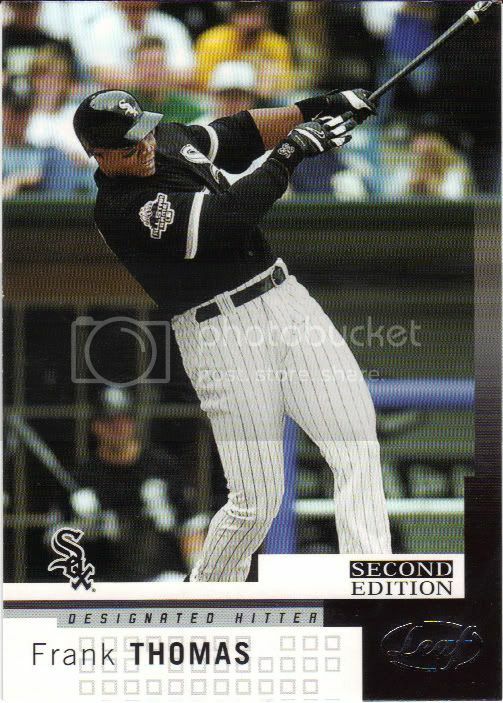 The Big Hurt is running away from a Big Baseball Boulder. Standing “O”. More like Standing “O my, look out behind you!” Am I right? Yeah! I honestly was not sure if this was a separate set, or an insert from this year’s Upper Deck. I hadn’t heard of it before and it could go either way. The stat lines on the back lean me to believe full set, and looking it up confirms Hopefully they changed the colors for other teams players, because it’s a nice looking card that suffers from some drabness. I don’t understand Second Edition Leaf either. All I know is that there is a metric ton of these that I have to grab down the line. Is this their version of Opening Day? It doesn’t look any different from regular Leaf except for the little box above the logo. There’s so much I still need to learn about the dead zone time of collecting. It’s a whole other era that’s largely gone away already. 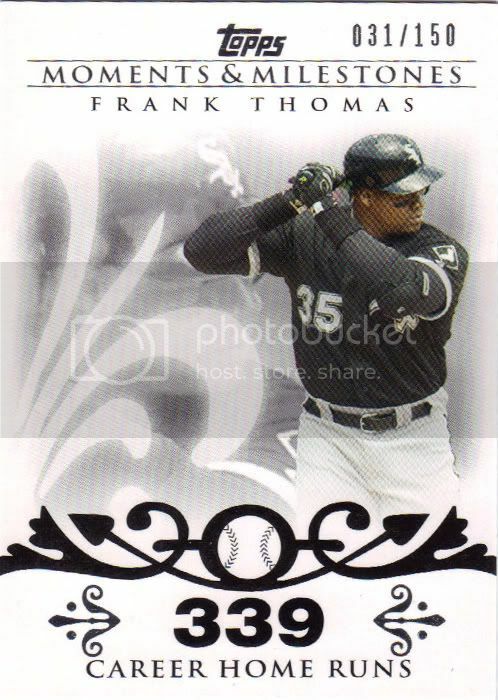 If you remember my other Topps Total Frank Thomas card (too lazy to link), you’ll notice that both feature something of a birds-eye view. I really like this angle. I like that he’s shown fielding first base (even if he was largely a DH at this point). The only thing that would make the photo better is a runner in frame somewhere. I guess there were some positive things about this set, even if I’m one of the few bloggers against bringing it back. 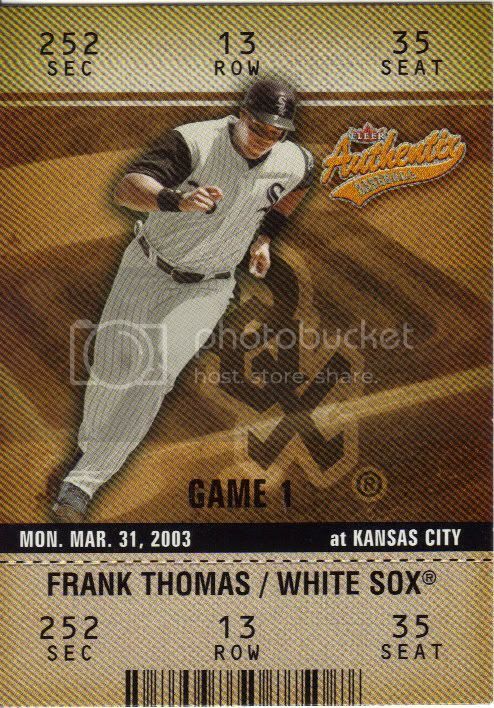 Similar to how I’m going to detail every Win on the Greg Maddux Moments & Milestones cards I get (and I have a bunch to go through one of these days), I’ll be detailing the circumstances around every home run for the Frank Thomas M&M cards I get. 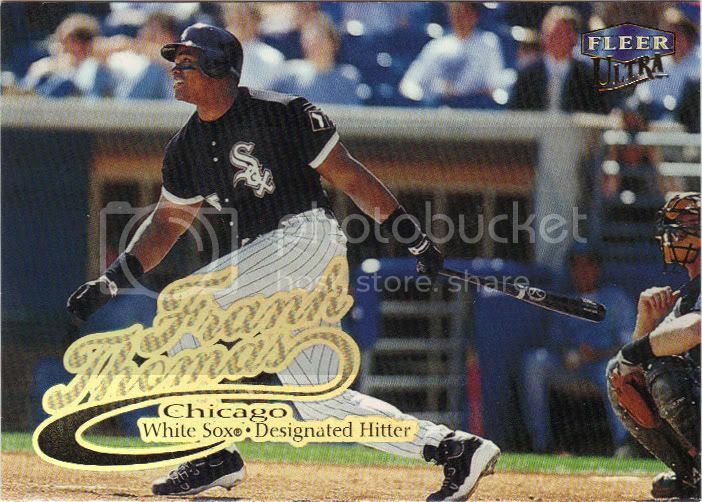 The White Sox were already up 4-0 in the bottom of the 7th, when the Big Hurt (acting as DH, as he was prone to do) came up with runners on first and third and 2 outs. The 2-2 pitch went over the wall to score Singleton and Valentin to put the Sox up 7-0. The homer was hit off of Albie Lopez, who Thomas faced and hit a solo shot off of just 6 days prior. And there you have it. I honestly could have gone on much longer. AdamE sent me two thick bundles of cards and even wrote what I hope was a sarcastic note stating “sorry I couldn’t find more.” Trust me, you found plenty. You went above and beyond what was asked of you in the junk trade. I would have been happy with just the 80’s Donruss Gwynns. One of these days I’m going to sit down and find a nice stack of Red Sox to help make up the difference. Thanks, again! 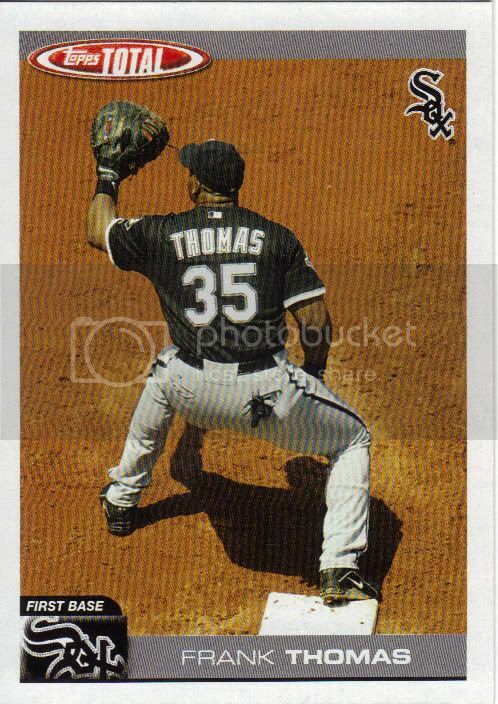 You’ll have more Thomas’ and a few Maddux’s in the mail tomorrow. I don’t know if you’d be interested or not, but I might have something very interesting for your collection. 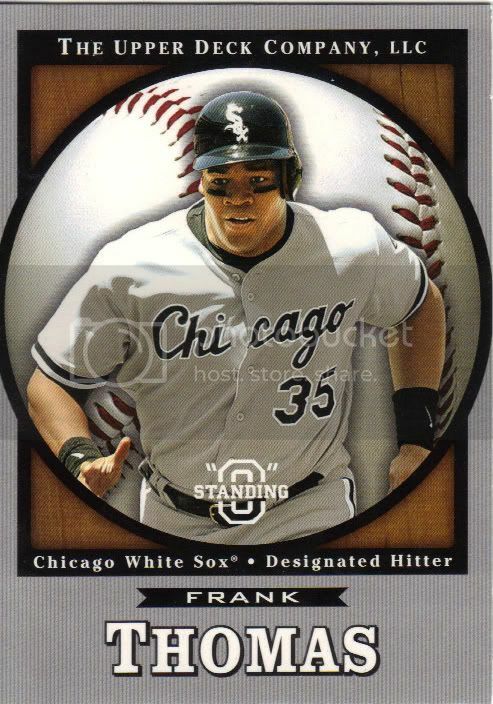 I think they’re from 1993, but Leaf offered giant Frank Thomas posters advertising the set and I ordered a few. Let me know if you are interested and I can get one out and photograph it for you.